“I’m here to ask a favor, a big one. “The Trust” was about a robbery in “Ocean’s Eleven” style by a “Dumb and Dumber” looking duo. In this film it’s “Ocean’s Eleven” mixed with portions of “Speed“. But this time without an adorable Sandra Bullock at the steering wheel. Robert De Niro doesn’t need to prove that he’s a class actor. That’s beyond dispute. But if you look at the list of films he played in the last few years, I can only conclude that he just did a favor for a bunch of friends. Sometimes his contribution is terribly limited (as in “The bag man” and “American Hustle“). Mentioning his name is obviously part of a purely commercial strategy so the movie will get some extra attention. And there are a few films of such a pitiful level, that you start to believe that De Niro is hopelessly addicted to acting and he can’t refuse to cooperate each time a script is shoved under his nose. Mind you, this isn’t the movie made in 2001 with Gene Hackman and Danny DeVito playing in it. I myself have never seen this version. But I am convinced that it can easily surpass this uninspired creation. Perhaps the chosen title is already a sign on the wall. Is there an even more meaningless and unoriginal title as “Heist“? Maybe it was intentionally to choose this title just to match it with the overall concept. Ultimately, there’s nothing startling or innovative about this movie. It’s a line up of clichéd events. Believe me. After one night, most details of the movie will be erased from your memory. 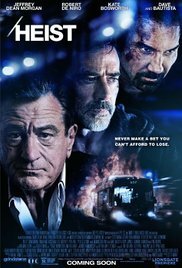 Luke Vaughn (Jeffrey Dean), an ex-soldier and blackjack dealer at a casino of The Pope (Robert De Niro), an unscrupulous mafia boss, is facing a huge problem. The procedure for his terminally ill daughter costs a fortune. His plea directed at The Pope is being rejected. The only choice he has (apparently) is to rob the vault of this thriving casino with the cooperation of the disgruntled bouncer Cox (Dave Bautista). That the robbery wouldn’t go smoothly was predictable. And during their escape they hijack a bus. What follows is a chase by a squadron of policemen and also the furious entourage of the Pope. It looked like “Smokey and the Bandit“, but less humorous. The key words that first occurred to me were unoriginal, an obvious development and laziness. I was experiencing a whole range of deja vu’s. And De Niro is a class actor who can make a memorable impression with ease, but his talent alone isn’t enough to hide the fact that this was a not so exciting and rather boring movie. And Gina Carano isn’t exactly the person who’ll lift this movie to a higher level either. Not to mention the pretty senseless ending. It’s because I’m a huge fan of De Niro that I didn’t pull the emergency brake much earlier.